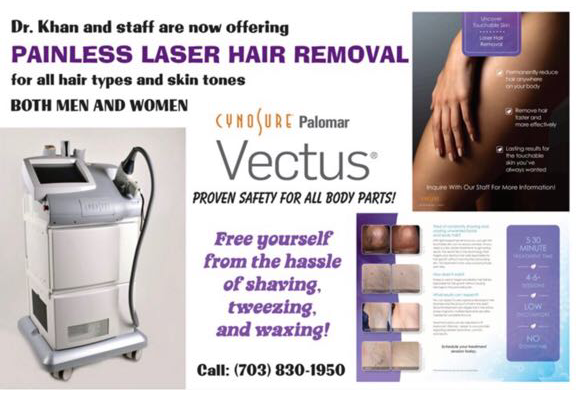 The Chantilly Office is pleased to offer LASER HAIR REMOVAL services to men and women! New latest technology state of the art VECTUS hair removal laser for painless hair removal with proven safety and promising results. Works on all hair types and skin tones for all body parts. Please pass this info to all your family and friends today! *[All Female OB/GYN] is an independently owned and operated care center that may[promote, sell, or provide] [laser hair removal]. Privia Medical Group is not responsible for these products or services. Privia’s Authorization & Consent to Treat, Financial Policy and HIPAA Notice of Privacy Practices are not applicable to these services or products.